The service pack addresses some specific issues from the ArcPad 8 Service Pack 1 release. It includes a number of bug fixes and a new developer sample. For a complete list of issues that had been addressed in the service pack, please see the ArcPad 8.0 SP2 Readme file. The key issue addressed in SP2 is the behavior of the GPS. There is improved performance and frequency of updates to the GPS cursor, GPS panel and GPS position window. Unnecessary flickering of the GPS has been removed. TerraVea has introduced the Course Mapper GPS, a high-precision GPS mapping system developed for golf industry professionals. 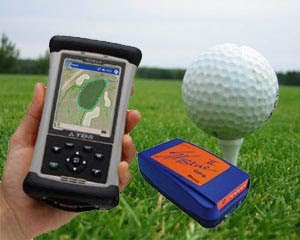 The Course Mapper GPS system uses Geneq's SXBlue II GPS, Tripod Data Systems' Nomad ruggedized PDA, and of course ArcPad.